We will always be just a phone call away if you ever need a garage door repair or a garage door installation in Montpelier, Vermont. Champlain Door Systems has been around since 1990, and we have been able to grow over the years because of our commitment top quality work at affordable prices. As the capital of the state, Montpelier holds a very special place in Washington County, and it is a great place to traverse a career path as a government employee. It is also a breeding ground for future fine chefs, because it is the home of the New England Culinary Institute. Our company can respond to garage door repair and installation calls anywhere in town, from the Vermont College of Fine Arts area to the Elm Street/Mill Road section south to Dog River Road and Memorial Drive. Many businesses are heavily reliant on overhead doors, and we have extensive expertise with commercial garage doors of all kinds. Our technicians can repair garage doors and garage door openers, and they have experience with all different types of makes and models. We have top quality commercial garage doors and garage door openers in our inventory, and we sell and install gate openers. Gate opener repairs are in our wheelhouse as well, and we sell, install, and service loading dock parts and loading dock equipment. The quality is always there when you work with Champlain Door Systems, but we do a good bit of volume, so we can negotiate low prices that we pass along to our customers. The commercial work that we do is a large part of our business, but we are also a reliable resource for residential garage door openers, garage door repairs and garage door installations in Montpelier, Vermont. When it comes to our garage door repairs, we can get to you in a hurry, because we have numerous trucks that are intelligently dispatched throughout the city, and we prioritize emergency situations. 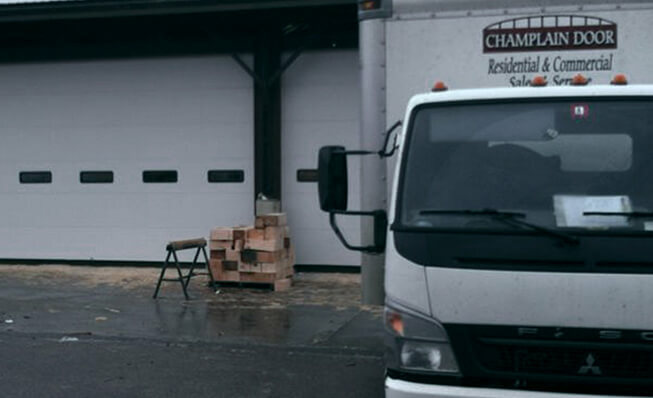 When you work with Champlain Door Systems, you will get quality workmanship, top-notch equipment and materials, and world-class service each and every step of the way. If you are ready to get started, you can speak with one of our Montpelier, VT garage door specialists right now if you give us a call at 802-524-7595 or 1-800-585-7595.